When's the last time you saw a sweatshirt in the pages of Vogue? I wouldn't be surprised if the answer is "never" — unless we're talking one of those very high fashion embellished versions. So it's no surprise that Anna Wintour has never worn a hoodie, either. After Instagram's Eva Chen presented the EIC with a zip-up hoodie, she quickly realized that there was zero chance that Wintour would actually put it on. After all, the Vogue editrix probably wears Chanel to sleep. Wintour stopped by Facebook's headquarters to talk about some of the editorial decisions that she's made over the years. After she was finished discussing such important topics as why she put Kimye on the cover in 2014, Chen gifted the fashion royal her very first hoodie — a plain grey zip-up with the word "Instagram" across the front. Picture Wintour lounging around her lavish office waring a social media branded sweatshirt. Not happening. According to Chen's Instagram post, she tried to get Wintour to wear the shirt, but Wintour quickly shut her down (gracefully, of course) saying, "I've never worn a hoodie before!" In all honestly, it makes complete sense that she's never worn a zip-up sweatshirt. I mean, she's always impeccable! Chen's post says that Wintour neatly folded it up afterwards, naturally. I wonder what she did with it after she left Facebook? I'll be keeping my eye out for any Vogue interns wearing the look. Behind those oversized designer shades was probably a look of much confusion. I'm rather impressed that Wintour has made it through 65 years of life without turning to this comfy style staple even once. With her background in fashion and her elite knowledge of the industry, she chooses to layer in style instead of comfort. Here's the closest she's come to rocking a sweatshirt (spoiler: not very close). This is a simple shawl that she used to cover up with, and it didn't stay on for long. When most of us get cold, we slip on a sweatshirt. The Vogue editor instead chooses to drape a cardigan across her bare shoulders. Wintour again tied a sweater around her shoulders to watch the U.S. Open. Because when Wintour is chilly, she doesn't cover up with just any old thing. To the average eye, this might look like your typical comfy vest, but it's actually another one of her shawls. 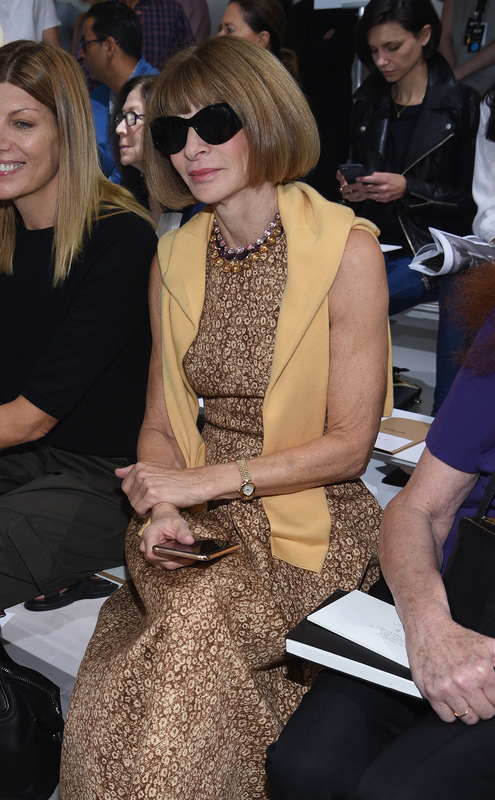 Wintour rocked this mix between a sweater and scarf to sit front row at fashion week. This is as close as it gets to a sweatshirt for the EIC. The editor usually opts for a button-up cardigan instead of a zip-up sweatshirt, and that's what makes her fabulous. Next time you're going to grab your loungewear, try some Wintour-inspired cover ups instead.